Out Featured Property of the Week is defined by pristine interior spaces, welcoming sophisticated entertaining while breathtaking grounds beckon the seemingly endless summer that it's coveted location enjoys. 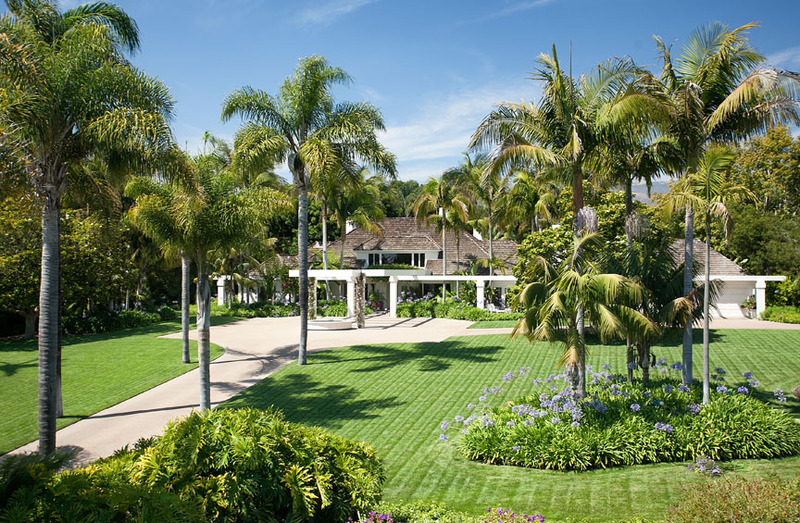 Behind an impressive set of entry gates, a spacious drive circles a pond at the port cochere. The commanding residence is surrounded by beautiful mature landscaping with expansive lawns that match the home’s immaculate interiors. The entry foyer introduces the striking interior and desirable open plan of the home. A sophisticated great room is an ideal space for entertaining, encompassing the formal living and dining rooms and a chic, opaque glass bar. Ocean-view bay windows, stately columns, a warming fireplace, and detailed art lighting adorn the room while a wall of glass doors and windows frame the home’s picturesque grounds, lending an air of casual relaxation to the elegant great room. Adjacent to the kitchen, the family room is a welcoming space for casual leisure with a cathedral ceiling and exposed trusses, fireplace, and built-in media cabinets and bookcases. French doors open to an ocean-view patio while a separate door provides access to the detached garage. Additionally, a powder room is conveniently located between the kitchen, family room and adjoining living/dining spaces. Nestled among swaying palms, coral and oak trees and lush lawns, the pool cabana/guest studio provides additional guest quarters with a convenient full bath and kitchenette. The estate’s magical grounds are a lush palette of tropical foliage and tranquil water features, including a waterfall flowing into the swimming pool. A beautiful, private haven with ocean and mountain views in Hope Ranch, pristine interiors and enchanting grounds are combined in this peaceful and serene property. An impeccable estate with lush, tropical grounds, this property enjoys a plethora of amenities adorned in sophisticated finishes. Click here to discover more pristine interior features and learn more about this sensational property.